This recipe for Chicken Cacciatore is the real deal and tastes like the an old Italian family recipe. Also known as Hunter Style Chicken, this meal is the perfect combination of dark and light meat chicken and when paired with delicious tomato, mushroom, onion, garlic and oregano it’s enough to make anyone’s mouth water. Feel free to serve over rice – as called for in our recipe, or if you’re feeling a little adventurous spring for cheesy risotto, mashed potatoes or a few cups of your favorite pasta. Chicken Cacciatore is one of those meals that gets better each time you prepare it and further customize it to your family’s tastes. This recipe has been known to include additional ingredients like celery, crushed red pepper, zucchini, basil and red bell pepper, so feel free to get a little creative! Disassemble the chicken by cutting into two breasts, two wings, two thighs and two legs. Wash all pieces and cut dry. Melt shortening in a large skillet over medium heat. Combine salt, oregano, and flour. Coat chicken with mixture, then cook in the skillet 15 to 20 minutes until light brown. Add onion rings, green pepper and garlic to skillet. Cook and stir over medium heat until onion and pepper are tender. Stir in tomatoes, tomato sauce and mushrooms. Add chicken to sauce and cover tightly. Simmer 30 to 40 minutes or until chicken is fork tender. 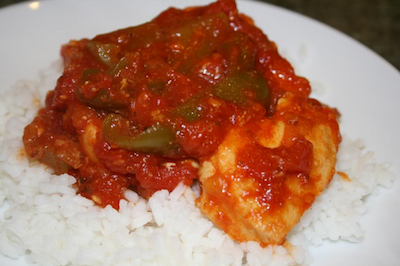 This entry was posted in Poultry, Recipes and tagged Chicken Cacciatore, Food Delivery Service, Grade A Poultry, Hunter Style Chicken, Passanante's Home Food Service, Recipe by Passanante's Home Food Service. Bookmark the permalink.